The fine city of Norwich in Norfolk is about to become host to the UK’s first bar where punters can get a beer for every day of the year, to go with its previous record of being the first city to boast 365 drinking holes. 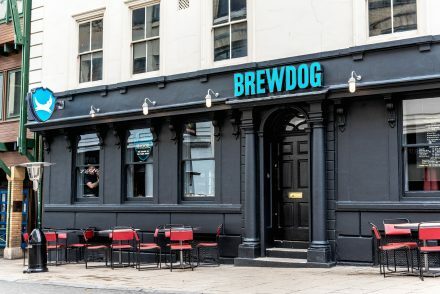 Irreverent craft brewery, BrewDog, is launching BrewDog Norwich all guns blazing with an unprecedented number of kickass craft brews for beer buffs to get stuck into. The bar will throw open its doors to the public on 15th April, offering a world of different styles and strengths of beer in the bar, a fully stocked bottle shop, and bar food including must-try “hopped up” fries. There will be 25 draft lines, including guest taps from Oskar Blues, Mikkeller and Beavertown, and the brand new bottle range offering a huge selection of different guest beers (which will rotate every three months); a mix of BrewDog headliners Punk IPA, Dead Pony Club and Jet Black Heart, and new badass beers Born to Die and Barrel Aged Albino Squid Assassin, alongside beer from local microbreweries and international craft comrades, such as AleSmith, Almanac and Stone Brewing. The craft brew of the day will be displayed inside the bar, offering the ultimate tick list for Norwich’s beer obsessives. Those taking up the gauntlet to sample all 365 can tweet their tasting notes to the bar using @BrewDogNorwich and the hashtag #BrewDogNorwich365. BrewDog Norwich will be located at 1 Queen Street NR2 4SG, in an incredible Grade II listed building. BrewDog has stripped back years of neglect to reveal original beams and brickwork, and kitted out the bar to hold 180 Hop Heads.